THPBlog: Sierra Pacific Industries to clearcut log near Trinity Lake and the Trinity Alps Wilderness Area. Sierra Pacific Industries to clearcut log near Trinity Lake and the Trinity Alps Wilderness Area. THP 2-13-035 TRI (Kay 13 THP) Sierra Pacific Industries, 185 acres; 84% clearcut, 15% commercial thin, 1% selection logging. Stoney Creek, Mule Creek (MD: T35N R9W Sec.24, 25). Winter operations, low erosion hazard, slopes up to 50%, 5 oversized units, herbicides, impaired 303.d watershed, 3 spotted owls within 1.3mi, bald eagle sightings near Trinity Lake, trees up to 30" dbh. Estimated public comment deadline: 09/14/13. This THP is about 10 miles NE of Weaverville, CA and very close to the Stuart Fork of Trinity Lake and Highway 3. The THP area is also close to the Trinity Alps Wilderness Area and Trinity Lake which are popular recreation areas. 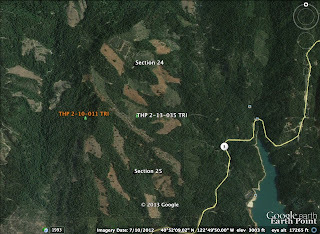 Sierra Pacific Industries is planning this clearcut THP adjacent to their 2010 Dyno THP 2-10-011 TRI which clearcut over 276 acres, and is already showing up on Google Earth (see attached photo). Tractor logging is planned in mixed conifer forests at an elevation of 2,800 to 3,300 feet. SPI is requesting an exception to be able to use class III crossings during the winter period. There are 5 oversized units, and 2,900 feet of new road construction planned. 1 spotted owl was reported to be within 1.3mi, although there could be as many as 3 spotted owl territories in the area (TRI0156, TRI0316, TRI0019). More information is available on the THP Tracking Center website.